The NYS DOT property is probably the next big, Old Library-type project facing the county in the upcoming couple of years. There’s a lot to consider in a possible move of the DOT to Dryden, and subsequent sale of the site to a chosen developer. For that, the county paid $78,000 to Fisher Associates to conduct a feasibility study, the results of which are shared below. The feasibility study examined multiple angles – environmental, physical, market and financial factors. It has to, because without a through examination of the site, the county could under-price themselves, or vice-versa, there may be fewer or no offers, should buyers think the site’s a poisoned chalice. But let’s start with the initial disclaimer – things are years out. The Old Library site issued an RFEI in November 2013, and a preferred developer was only named in August. Plus, everything is still dependent on a DOT move, which will have its own schedule if it happens. All things considered, although the county has generously offers 2017 as a construction start date, it’ll probably be the end of the decade if not the 2020s before any soil starts to turn, assuming there’s an interested developer. So let’s start with a look at the site’s history and environmental concerns. According to Fisher Associates’ Environmental Site Assessment (ESA, link here), the property was virtually unused until the NYS DOT bought the land and starting building their facilities on it in 1958. There were petroleum tanks underground, but they were removed and the land re-mediated in 2004, and now the only tanks on-site are above ground, and in good condition. Some concerns still exist with salt brine tanks, debris in the inlet, and materials from when the DOT used a septic system, before it was hooked up to the city sewer. None of these appear to be potential deal breakers, just things worth noting. Perhaps surprisingly for a waterfront property, the vast majority of the site isn’t in the 100 or 500-year flood zone. Most of the site is elevated just enough to avoid flood risk. Empire GeoServices of Cortland conducted the geotechnical report and site soil analysis. Looking at the soil conditions, being next to the water poses some limitations. Most of the lower elevations of the city suffer from poor, water-logged soils, which are soft and compressible near the top – in a few cases, shallow spread foundations, typically the cheapest option, have been damaged by excessive soil settling, so those are not recommended. Deep, pile foundations, like the ones used at the Lofts @ Six Mile Creek (micro-piles), Marriott (caissons) or some of the big box stores, are a safe option because they go down to more solid soil layers, but they’re more expensive. Shallow mat foundations can also be used in place of shallow spread foundations, but they’re also more complex and expensive, and are really only suitable for “light buildings” with less pounds for square inch. A mat foundation was used for Cornell’s new rowing center. Long story short on the soils, it means that whatever is built will need a complex foundation, and its likely that whatever gets built will be priced at a premium. The study tacks on an extra 10% to the cost for townhouses and mixed-use buildings. In the study, there are three plans considered – a hotel plan, a multifamily/townhouse “preferred” plan, and a maximum density plan. The site plan PDF is here, for you kids following along at home. The hotel plan imagines a 124-room hotel (midsize in the Ithaca market) with 6450 SF of commercial space. The plan includes 10 townhouses and 52 multi-family units in the 850-1200 SF range. 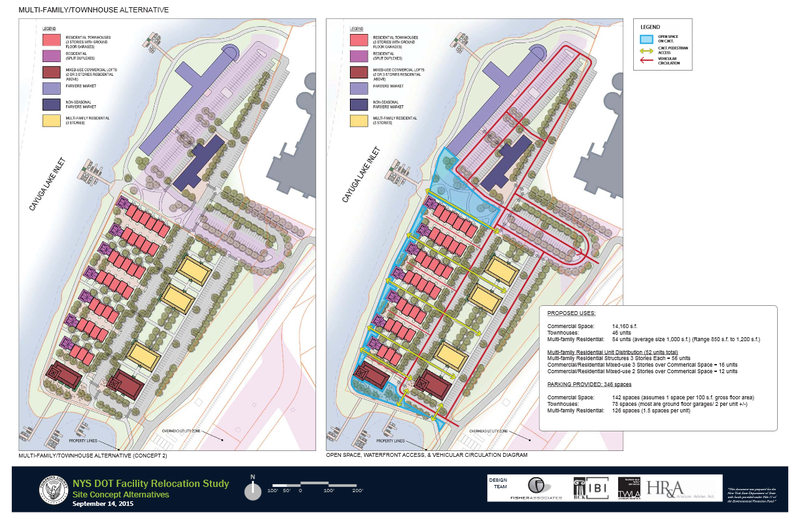 There are 286 parking spaces, as required by zoning – 1 for each hotel room (124), 1 per 100 SF of commercial space (64), 2 for each townhouse (20) and 1.5 for each apartment-type unit (78). 1 Space for 100 SF commercial space is fairly generous to drivers – the ITE trip generation manual shows most commercial retail to be well below that threshold, with only service outlets like fast-food joints, coffee shops and bars exceeding the 1 space/100 SF value. The market issues with this plan are focuses on the hotel. A hotel was envisioned for the waterfront for decades, but being off by itself with only few nearby attractions (the trail and farmer’s market, not much else), it’s not as desirable as downtown, nor is the land as cheap as the Southwest suburban corridor. The feasibility study notes the waterfront might be a draw in the summer, but the weather the rest of the year would limit its appeal. With increased interest in living in the city, the hotel idea has had less allure in recent years. Still, the option was included for the sake of comment and critique. The study says a hotel would need 120+ room to support fixed costs (taxes, maintenance), and recommends a brand not present in Ithaca, like Hyatt or Starwood (Westin/Sheraton). The multi-family/townhouse plan does away with the hotel and instead focuses more on residential. The plan is composed of 14,160 SF of commercial space, 46 townhouses and 84 multi-family units (130 units total). 356 parking spaces are provided. The maximum density plan is as it sounds – the maximum legally allowed by zoning. The plan calls for 13,950 SF of commercial space, 137 multi-family units and 378 parking spaces. Note that all three plans have a new indoor farmer’s market building, but that’s a separate development being spearheaded by the market. Renderings make for great eye candy, but the emphasis is definitely not on the architecture here, because it’s a bit like predicting what new cars will look like in 2020. You know it will probably have four wheels, lights and doors, but everything else is just for show. 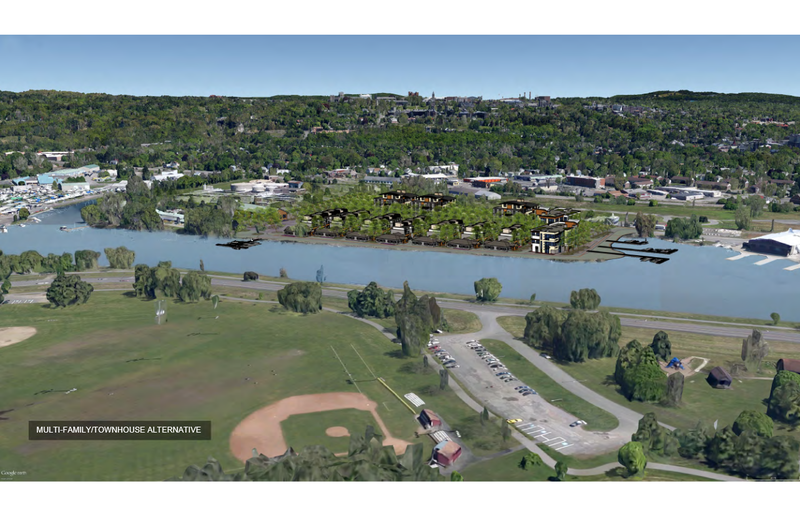 Whoever buys it will come in with their own idea of how things should look (see Form Ithaca’s waterfront study for their take). For the sake of reference, a copy of the aerial renders of each layout is here. Now for a financial summary (link), the feasibility in its essence. HR&A Advisors, who partnered with Fish Associates for the study, notes that development can work with a potential buyer’s bottom line, but it’s going to be expensive and the developer will seek to minimize risk as much as possible – there’s not much padding in the profit. There are few comparable products in the county to the site, which makes determining the market size, rents and level or risk somewhat more difficult than usual. The study assumes a 3-year, single-phase build-out. The study assumes about $2.15/SF for a residential unit – in other words, a 1,000 SF unit (like a larger 2 bedroom or smaller 3 bedroom unit) renting for $2,150/month, similar to the Lofts @ Six Mile Creek or Gateway Commons downtown, which were used as comparables. Luxury housing, without a doubt. The waterfront commands a price premium, but the disconnection to the rest of the city could hinder rentals. Some condos/owner-occupied units are possible, but rentals would be the majority. Development costs range from $165/SF for a townhouse, to $215/SF for a multi-family unit, to $287/SF for the hotel. 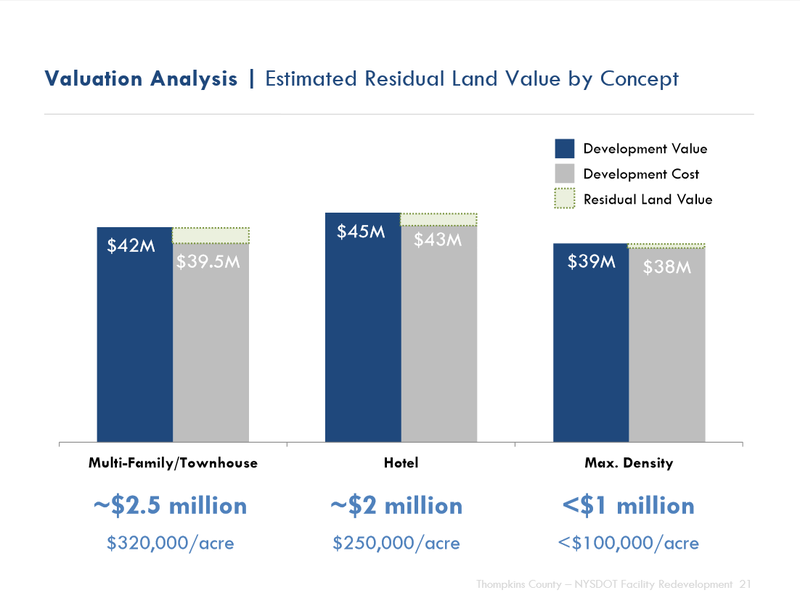 The value of a project ranges from $39-$45 million depending on plan, and with development costs taken into count, the land could sell for something less than $1,000,000 to $2.5 million. Over time, the project may generate $13-$22 million in tax revenue over 20 years, depending on approach. The land itself will not sell for the price required to cover the DOT’s cost of moving, which will have to be underway before any sale takes place. The move is estimated at $14 million. This means that the city and county may have to chip in on upfront costs in order to get a good project in that will pay itself off via tax revenue. HR&A notes that an RFP should be flexible in its options, and be open to zoning variances that might improve a project’s chance of success. 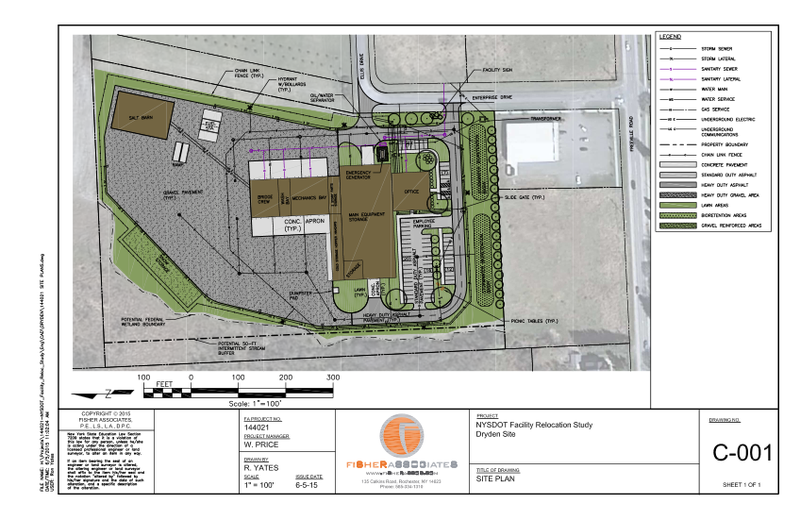 For what it’s worth, Fisher associates also did a conceptual layout for a new DOT facility here. 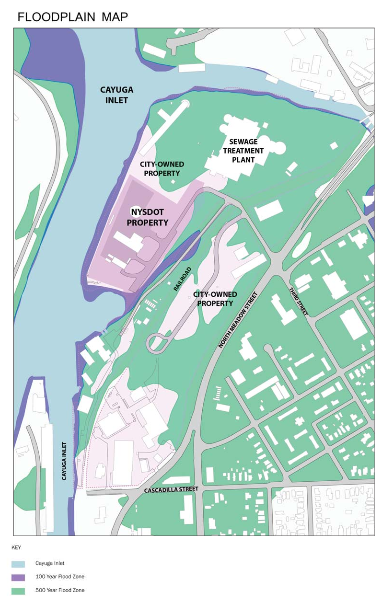 A financial plan for the redevelopment of the Cayuga Inlet site that reduces the risk for private developers and generates revenue to support the move of the existing NYS DOT facility. An analysis of the project’s impacts on infrastructure and utilities, the natural environment, neighborhood and adjacent properties, and the surrounding road network. An estimate of the land value of as well as the individual components of the plan. 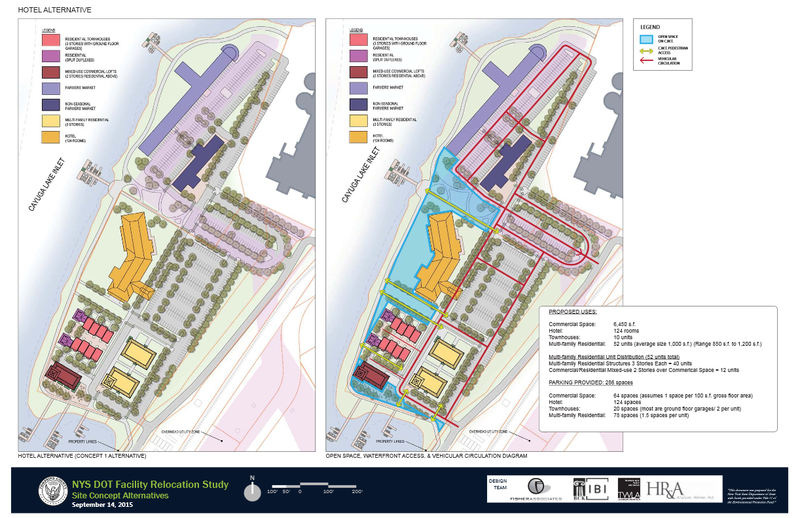 The result will be an order of magnitude valuation of the site to better understand the project’s ability to attract private investment, support debt, and support a purchase price and tax revenue stream that could be used to advance the NYS DOT facility’s relocation. A draft Request for Proposals (RFP) to solicit developers to redevelop the site. An estimate of the ongoing direct fiscal benefits to accrue to the City of Ithaca and to Tompkins County, including real property taxes, personal property taxes, school taxes, sales tax, and other applicable taxes and fees. 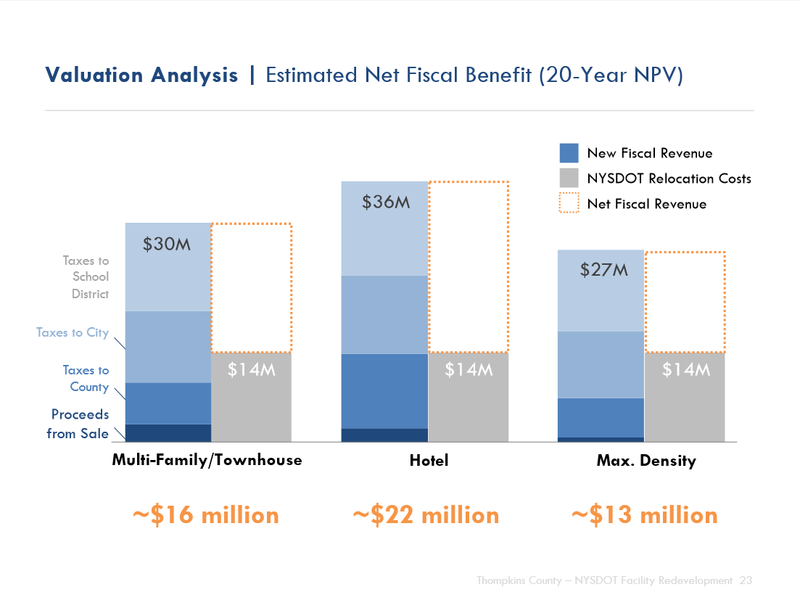 A financial strategy for moving the DOT site with some combination of revenue from sale of the site, direct funding from NY State, and, possibly, a local contribution from anticipated tax revenues. Expect that last one to be potentially controversial. The state might move slow but could be supportive, but the city will have to explain and hope that a possible initial investment in the DOT’s move to Dryden could pay off over subsequent years. Voters don’t always like long-term plans. Given all the complicated steps involved, this seems like it will take so long to happen that it’s not even worth being excited about. We’ll probably see a fully operational Chain Works District and a fully-rented SST before a single shovel’s in the ground here. That said, I agree the hotel plan doesn’t have the best chances for the seasonal reasons you describe. It’s too bad downtown isn’t closer. Ithaca’s original sin may have been not centering the town on the lake like, say, Skaneateles, which rakes in tourist money because it did (often wonder about the logic of this historically – did it have to do with the milling opportunities offered by the swiftly flowing creeks instead?) That said, hotels on the Finger Lakes away from downtowns elsewhere (like Geneva) seem to do okay, as long as they’re relatively self-contained affairs and don’t rely too much on local context. Milling was definitely a part of it. Flooding and typhoid/malaria were also major factors. In the time before flood controls and sanitation, Ithacans used to avoid the inlet and surrounding areas, and its partly why downtown developed where it did. I think that right now, even the resident NIMBYs aren’t worried about this, given how far off it is. The vast majority of them aren’t exactly fans of salt sheds and snow plows either, so apart from overloading any potential RFP with too many demands, any fights will be way, way down the road. Hopefully once the downtown gets all the approved projects built, and more Ithacans agree that the downtown has come back to life (through density and a more urban feel), a project like this might be seen as a big boost for a continued transformation of the West End/waterfront. I know that the deep pile foundations are expensive, but this could be a project where some negotiation is possible. If a nicely designed hi-rise affordable senior building was placed in the NE corner of the property (requiring the expensive deep pilings option), the majority of the rest of the site could be developed as Cornell Phd suggested with a dense townhouse neighborhood with some green space. The parking requirements for the senior tower would probably be less than the current options. And the strip of land along the east side of the property could fit a parking area including overflow for the tower.